Before my mom passed away in January, she gave me a bin marked "Mom and Dad's Treasures - 57 Years Worth". And she wasn't kidding, in either the fact that they're treasures, or the fact that it was chock-full of papers and photos going back over five decades. Most of what was in there I'd seen before, but much had been forgotten. The birthday cards we kids had given her, the Mother's Day notes and the letters sent between family. People I haven't thought of in years suddenly standing before me on the pages of old newspaper clippings and letters. It's been a wonderful trip down Memory Lane but the bin also posed a bigger question: What happens to all this once I pass on? To answer that, I've been going through each envelope in the bin and divvying things up. My sister and brother are getting all the cards they sent Mom and Dad over the years and whatever pictures that pertain to them (there really aren't a lot of pictures. Mom split those up years ago). The stuff that pertains to me will reside in the bin for my kids to look at, store, give away, recycle. Of course, going through their bin made me think of all the stuff I have hanging around here that's just sitting in bins, so I've hauled them out and have been going through those as well. I tell you, I might as well work in a museum! In fact, I feel much like a curator, making decisions about what to keep, what to recycle, what to give away. Ever since the kids were little, I've kept a binder for each year. In it are news articles, programs, flyers...anything that helps tell the story of that year. Most are one-inch notebooks, but some years are a little more full - and so need bigger notebooks. 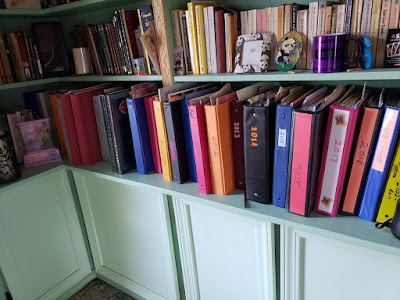 This shelf contains the notebooks from 1998- present day. I'm nearly out of room. I figure two, maybe three more years I need another shelf. But I can't tell you how often we check the notebooks to see when we did something or when we went where. I've scrapbooked most of our vacations (see below for a note about THAT! ), so those are interspersed with the appropriate years. And they stick out at odd levels because I recently added the calendars for each year to the notebook itself (prior to this, the calendars were just stuck in a bin - like SO much else!). Regarding vacations - some are in the 12 X 12 scrapbooks, some are in regular binders, some are within the year's notebook, depending on the length of the time away. HOWEVER, I recently brought down a bin that held not one, but TWO vacations I never got around to putting into anything. There they sit, the journals, the photos, the receipts - everything- each in a plastic bag waiting for me to remember they exist. My husband recently got into the trip along Memory Lane as well since in that same bin was a smaller box of letters he'd received before we got married. He got a LOT of letters when he was in college - and he kept them all. So cool to read notes from friends he hasn't seen in years - and several he sees often. But it was the letter from his Dad that brought him up short - the only letter his dad ever sent to him in college. What a true treasure it is now. Of course, I've been reading as well - my book list for March is below. You'll note the genre are varied, as are the authors. The last two I put on the list, but I didn't actually read them. I STARTED them, but gave up. Both too dry. FWIW, I'm really enjoying Patrick Rothfuss' series, although I didn't realize until I finished Wise Man's Fear that the next book might still be years away. Sigh. Dragon Wing is the first book in a seven-book series and I didn't like it enough to keep going.